Frankly there are no competing devices for the Hybrid. The only other roulette prediction devices are vastly different. As with roulette systems and other gambling strategies, most are either scams or nowhere near what the seller claims. Unfortunately the entire casino and gaming industry is full of some of the most malicious and dishonest people imaginable whose only interest is to sell nonsense to unsuspecting gamblers, not to develop genuinely effective devices to win at roulette. In particularly as our technology is far beyond that of other developers, we are the target of many attacks from envious individuals. Incredibly our staff members have even received threats of violence from sellers of other devices and systems, which appear to be more the behavior of desperate people. If you are considering any roulette prediction device, expect the vendor to lie to you about both their technology and that of their competitors, so it is important that you conduct your own thorough research. 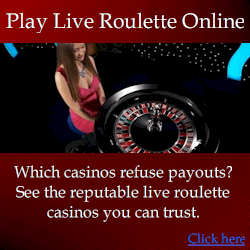 Most roulette computers are scams, and they ensure you lose money instead of making money. The difference between devices is often the difference between millions in profit, or a depleted bankroll. With regards to roulette computers, we have already acquired every other device that is available, so we are fully aware of their capabilities. Some we purchased ourselves, and some we were sent for free by unhappy purchasers. Despite each of the vendor’s claims, the devices nowhere near lived up to expectations. Vendor 1: This vendor attempts to convince his prospective purchasers his “zap” method is superior. What is the zap method? Instead the computer simply telling you where to bet, the device just gives you a painful electric zap shock. At the time of the zap, you note which number is under the ball – this gives you the “first number”. But that’s not even where you bet. To determine where to actually bet (the “second number”), you need to bet X pockets from the “first number” – you do this on EVERY spin. To determine the value of X, you must test about 20 spins. Now consider doing all this when you can realistically see only part of the wheel in real casino conditions, plus it is near impossible to observe the numbers under the ball when the ball is moving so quickly, with the wheel spinning in the opposite direction. . . Sounds ridiculous and impossible? It is, but the vendor dishonestly claims his method is better than the computer simply telling you exactly where to bet (i.e. an “audio” prediction). Why on Earth has he done it this way? Because it’s far simpler, not because it’s better. Recently this particular vendor attempted to develop a device that “speaks” the prediction, instead of using the zap method – he wouldn’t attempt this if he truly believed his zap method was superior. However, even if he succeeds, his device would still have many critical flaws which lead to virtually random results on modern wheels, as a professional casino consultant found when he tested this device. We do not intend to release information that would correct the device’s critical flaws, and we don’t merely mean the zap method – the flaws extend to the algorithms that make numerous critical mistakes. Image Left: public demonstration of two other roulette computers (Mark Anthony Howe and Forester-Miro Zirdum). Both devices have been openly tested on numerous occasions, and each time very poor results were obtained. Contrary to claims from each vendor, the devices are extremely poor. At least 80 individuals have witnessed demonstrations of these devices in public demonstrations. We demonstrated the vendor’s instructions were followed precisely. Further basic testing revealed clearly poor design of the devices. If you have these devices, you can visit the roulettecomputers.com website for suggested testing procedures. Vendor 2: This individual is the most dishonest person we’ve ever known. He has scammed many individuals with many different web sites and forum posts he publishes under fake names. He does this to both promote his own devices, and to spread false negative information about other device developers under fake names. This particular vendor also operates under numerous fake names and web sites to escape poor feedback. As with the other vendor, his device has numerous critical flaws. We receive many complaints about this vendor, and his lies are so incredibly blatant, and his behavior so obsessive that many people sincerely believe he may be mentally ill – this is not an exaggeration. Again, truly there are very dishonest individuals in this industry, and great care should be taken when purchasing any gambling product. To say this industry is cut-throat and extremely “dirty” is an understatement. To establish fact from fiction, you must not rely on the mountain of surface comments from dishonest competitors (under fake names or otherwise) – you must do your researchthoroughly, ask vendors the right questions, and use your common sense. Indeed the truth is beneath a colossal mountain of lies and rubbish. Typically, a roulette computer relies on manual clicking (called “clocking”) of a hidden button to time revolutions of the wheel and the ball. With a well designed electronic system, this is perfectly acceptable for most wheels, although most devices are not designed correctly which leads to errors that are far too great to produce the required level of accuracy. Videos on our standard device web site demonstrate how well our standard device deals with the inevitable human errors of “button clicking”. This simple video also disproves blatantly dishonest claims from other device developers that our standard roulette computer produces virtually random predictions because it cannot deal with manual clicking. * Numerous clicks are required to achieve an acceptable level of accuracy. By the time the required number of clicks are made, “no more bets” may have been called. * The user needs to physically look at the wheel. The longer you play on the wheel, the longer you are looking at the wheel, and the more suspicion you arouse. The Hybrid roulette computer system is very different: user skill or fatigue is irrelevant, predictions can be made with as little as one ball revolution (as opposed to timing many revolutions) so predictions can be much earlier, and the players don’t even need to look at the wheel, so they can continue winning for far longer without arousing suspicion. While the Hybrid may be more expensive, it is far superior to both our standard computer, and certainly any other roulette prediction device. It achieves a much higher accuracy rate than anything else, and it does so automatically. © 2019 Hybrid Roulette Computer — All Rights Reserved.